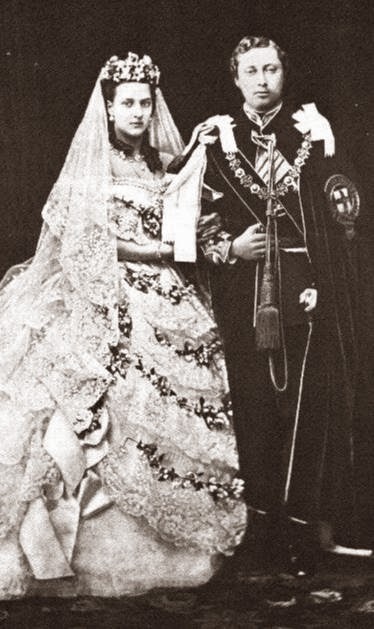 Because the Queen was still in the deepest mourning, the wedding was held at St. George’s Chapel at Windsor. The small venue meant that only Alix’s closest family members were invited, and Bertie was limited to inviting six friends. Holding the wedding at Windsor also denied Londoners the spectacle of the wedding of the heir to the throne, but the Queen would not hear of a more public wedding. Court mourning also decreed that female guests could wear only secondary mourning colors like mauve or grey, which must have been a bit of a disappointment. Alix’s dress was of white and silver satin, decorated with garlands of greenery; Bertie wore a general’s uniform under his Garter robes. But most of the eyes were on the Queen in a balcony overlooking the altar; she seems to have played somewhat shamelessly to the crowds, making it clear that witnessing what was supposed to be a joyous event was terribly painful to her (“I dread the whole thing awfully, & wonder even how you can rejoice so much at witnessing what must I should think be to you, who loved Papa so dearly, so terribly sad a wedding,” she wrote to her eldest daughter Vicky a few weeks before the happy event.) The Archbishop of Canterbury officiated, operatic star Jenny Lind sang, and Bertie’s nephew, Vicky’s eldest son, four-year-old Willy (later Kaiser Wilhelm II), behaved very badly, crawling about and biting people.